According to the unofficial guide to the Blogosphere, volume 2, chapter 3: "A blog should have a concentration. There should not be too many topics, too much bouncing from subject to subject. A good blog must focus, in order to build an audience, and hold the interest of the readers." This I have read, in countless articles and advice columns. And this same wisdom I have consistently ignored, neglected, even abused. But, hey, at least I am consistent. Today, in honor of the people who come here, to Chickenblog, looking for a particular focus, a certain subject... I am offering a chance to voice your preference. 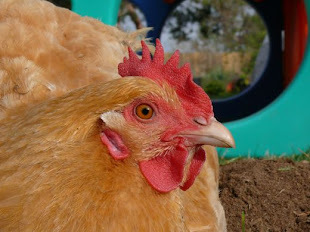 The subject of the next Chickenblog post will be chosen by vote, by the readers. Voter fraud is permissible. Vote early. Vote often. This is your chance to have your say, and dabble in corruption, too. Personally, my brain is full of deep thoughts and other musings, and I have a hard time sticking to just decorating, or showing my latest lipstick color. If I had a puppy, you know I would be all over that. And while I may only scratch the surface, like a happy hen, as I go pecking around, looking for good stuff, I find that the world has plenty to offer and I want to check it all out. Bigger than a bread box, heavier than a hammer. This box was delivered yesterday, and anticipated since forever! Those chicas! "I told you they was organised." Construction progresses nicely. Have you seen our joists? Maria is tracing on fabric, and she and Natalie are pulling needles and threads. What are these chicas up to? I've hardly done a thing since, but at least one day this week, I was the chef suprema, even concocting a new recipe using secret ingredient combinations. A bunch of inspiring and spirited kids, on their way to an International robotics competition... it's about Passion FIRST! Lillian Virgina Mountweazel had the spotlight yesterday. Normally she's a sweetie-pie, but this morning she is making her feelings known with her raspberry face... pffffft! I tried to explain to her, a blogger has to have thick skin, and not everyone is as keen about Ratty-Rats, as we are. The next post, the next topic of deep thoughts and other musings is up to you! Oh, the big mystery box from China, for sure. I love a mystery! Hey, you got rid of the word verification thingy. So did I! Who's the copycat? Can I vote for Bunny Condos? Barn! No, wait! Mystery box in the barn with a Ratty-Rat on it, eating something you cooked. I cannot decide between The mystery box and what you cooked on Monday! I want a post on both. I like that your blog bounces from topic to topic. It keeps my interest! Happy Thursday! H. Bunnies! It's so close to Easter. No? Maybe later then. Okay, then I vote for explaining what the Light Box will be used for. The only Light Box I'm familiar with was used for photographing cats. The light virtually bounced off the cat and made her glow like a bride. Made for a great photograph. What will Maria do with it? the mystery box from China reminds me of those cartoons I used to watch on Saturday mornings (remember when cartoons were only on saturday mornings?). So based on that, I suspect there is a kangaroo inside... a boxing kangaroo! So please let out the mystery!!! LOL, you are funny, lady. Consistently funny! I'm sorry - I've never read the instructions... I love the multitudes of your blogs. The variety - it is zesty and so lifelike. choose one - no way. Keep it coming straight up with a twist! thank you! !